Vacation rental cottage. Sleeps 6, 3 bedrooms, 1.25 bathrooms. Dogs allowed. Adorable mid-century cottage just across the street from the "Back River"! Pet-friendly AND cute! Across the street from the Back River/kayak launch and minutes to our little downtown area. Come on in! We're just waiting for you! Come behind the bright purple gate to the serene aqua patio and let yourself in! Our front door is purple too! The backyard with the tiki hut is super fun! Our bright purple gate welcomes you to pure mid-century living! Fully stocked & equipped kitchen! If you don't have what you need, Guest Services is available & we'll bring over what you need! The wonderful Florida room with its levolor windows walks you back into history. Harken back to a time of 'mad men' and cocktails at 5! Queen bedroom. There are 2 queen bedrooms. Full bathroom with standup shower. Our cottage features one full bathroom. We also have a 2nd shower completely separate. This bedroom features 2 twin beds. Canty's Cottage is full of original art from our local artists! Bright and cheerful local art. We love to support local artists! This shower is in a standalone shower room. This is side patio leading to the back yard & Tybee Tiki Hut! Such a bright and cute cottage from the outside, but wait 'til you get inside! We love this mid-century delight. You'll feel transported to another era and place. Canty's Cottage! You'll love it from the moment you get here! This home has lots of space. There are two seating areas - living room & Florida room. The family room looking into the dining room & Florida room. Fireplace is not operable. The family room looking into the dining room & Florida room. Living room has a faux fireplace and is right off the kitchen. Wonderfully slanted ceiling. Dining area is off the living room and kitchen for easy transition to and from dinner. All the little touches equal big memories! A million Instagramworthy touches in this adorable cottage! Even the lamps are cute! Even the pillows are fun! We love this mid century home from the 1950's. Vintage, yet freshly painted and redecorated. Canty's Cottage is a classic Mid Century Modern island home that Mary Elizabeth Canty and her family have enjoyed with family and friends since her childhood. Built in the 1950’s and completely restored with Central AC and all modern updates, this ground level, pet-friendly home features a large fully fenced back and side yards with views of the Back River and 1.5 blocks to Alley 3- the local Kayak launch area. 3 bedrooms and 1.25 bathrooms (one full bathroom with a tub/shower combo and one shower-only room), plus a Florida room and an amazing kitchen, this home is a little charmer! The Tybee Tiki-Hut is the ultimate finishing touch! Blend your margaritas (or smoothies ~ we won't judge!) and enjoy a little island style right here! Minimum Age Requirement: You must be 25 years of age to rent this property. Great location, loved being able to travel as a family with a home base rather than a hotel room. Fully furnished and equipped kitchen allowed us to stay on budget by staying in for family meals and visiting, BBQ made cooking a breeze. Walking distance to beaches, grocery, and restaraunts. Accomodating for travelers with pets. Fanatstic location, yard for dogs and fun cottage! I love this cottage. I stay every time I come to Tybee and it never disappoints! We so enjoyed the accommodations that Mermaid Cottages gave us, after listening to our needs and allowing us full input on our requests! Wonderful getaway in Canty's Cottage! The cottage was adorable and so comfortable. I could have lived here forever and been very content. Love the beachy touches and great colors throughout. Beds were comfortable. Plenty of room to unpack. Great kitchen and dining room. Gas fireplace and grill were not operational but not a big deal. Water needs to warm up a bit between showers. We would love to return to the cottage on a future visit. Tybee had fun shops and we enjoyed dining at Spanky's and Joe's Crab Shack and shopping at the friendly IGA nearby. This home, and the support from the staff, went beyond expectation. The pictures do not do the house justice (it is a hard house to shoot given it's angles). The house is amazing, full of charm and smart spaces. It is right next to the fishing dock, just a few minutes walk away, which leads you to the entire beach area. AJs is also a super short walk away, and with a golf cart, nothing is far. Additionally, the staff once again was amazing in their support. There was nothing "wrong" with this in any way, and I look forward to coming back! Perfect little beach house. Great location, minutes to the beach and AJ's. Quiet neighborhood and great yard for my dogs. I say it is the best although it's the first and only one of the Mermaid 's I've stayed at. Loved everything about it. Just enough room for 5 of us and the dogs. It is in a lovely section close to the inlet. I would stay with Mermaid cottage again because of their attention to detail. Everything we needed was in the cottage. It was very clean and comfortable. Can't say enough good about it! Fun mid century modern with all the amenities. Super clean & complete and well appointed and equipped. Perfect for me, my wife & 3 grandkids. We loved Tybee Island..... beautiful beaches, great restaurants and spectacular sunsets! So glad we were able to visit this part of our great country! This was a great way to stay and not be cooped up in a hotel. House was clean and not much else that could be needed. You rock Mermaids! I visit often for work and play and feel at home in Canty's. The Mermaids make sure I have everything I need each visit. We had an awesome time staying in this rental. It is absolutely adorable, has everything you need, and some of the most comfortable beds. Within walking distance of everything that we needed, and just a ten minute stroll to the beach. Also, this cottage was so clean! We loved the vintage charm that this cottage offered and would love to stay here again! Canty’s cottage for our needs perfectly. It is conveniently located to both the north and south beaches on Tybee Island. The house was clean and fully equipped. The “welcome package” fit all of our cleaning needs for the week we were there. Overall a great experience. thank you for stayig with us! Perfect cottage for a Tybee getaway! Well maintained and very clean. Well stocked kitchen. Loved the starter supplies from the Mermaids, especially the coffee. Easy walk to beach, restaurants, and pier. Only suggestion for improvement is to add another ice tray to the freezer. Great stay at Canty's Cottage! We spent four nights at Canty's cottage and had a great experience - not fancy but clean, comfortable, and great location. Everything you need for a fun visit to Tybee. We all left happy and wanting more. Pros: close to the boat launch, The neighbors we met were very nice, the house was clean and we enjoyed the coffee. We felt like we could call someone at any time if we needed to, all of the notes and little reminders with phone numbers and instructions on them were helpful. Cons: one of the bedrooms smelt bad, like dirty wet carpet or something. This didnt really affect us as it was only the two of us so we just slept in the other room, but if I had to stay in that room I would have been very bothered by the smell. Also the open window into the bathroom Was not cool, again with just my husband and I that’s one thing but if anyone stayed with us and could hear us going to the bathroom, well that is embarrassing. Very laid back - great beach - short trip to Savannah. We had a nice 3 day stay at Danny's. It as charm in a mid century modern way. Mermaid Cottages are the best. Homes are spotless and the Mermaids go out of there way to be sure you have a perfect stay. Loved all the storage - very useful space. Loved all the new pots & pans including cookie sheets of every sz. and a full complement of knives. Pantry was great. Would be great to have an outlet in the bathroom & 1 wall clock. Never could figure out the garbage/recycle pattern, but not a problem. Enjoyed our entire stay. This will be my home away from home! This is the perfect beach get away. Quiet neighborhood, close to everything and the cottage had everything I needed including a great yard for my dogs. I come to Savannah for business and have already booked this year's stays at Canty's Place. Canty’s cottage is a delightful place to enjoy Tybee Island and Savannah. It’s close to the bay side of the island but only a few blocks to the Oceanside. It’s in a quiet residential area with ample parking I lovely backyard and patio. We happen to be there during their historical snowstorm. The owners and mermaids were very accommodating and concerned about our safety and warmth. Great attention To detail.. We would definitely go back. We've stayed on Tybee for Thanksgiving 6 times now and Mermaid Cottages are always the best. Canty's Cottage is my favorite. We had 2 adults and 4 teens and plenty of space. Beach access on the quiet sound side (South) is less than 5 minutes on foot. Loved this place! I love Tybee Island and mermaid cottages. I always stay in pet friendly cottages so it's definitely 'home away from home'. I love the relaxed laid back feel of the island and will return again and again. The location of Cantys cottage is our favorite spot. I've booked with the mermaids 5 times and each stay has been perfect. Our stay at Canty's Cottage was AWESOME! Mermaid Cottages were very prompt and efficient in providing all the information we required once we reached Tybee. Our "Mermaid" Denise was very helpful in assuring we had everything we needed to make our stay worry and stress free, a real vacation. The cottage was well equipment for our stay as well as immaculately cleaned. Mermaid did an excellent job in stocking the cottage for our arrival. This was the first time we have not had to go out and purchase trash bags etc, when we arrived and the coffee provide was excellant as well. The cottage itself was very comfortable with a great view and location. There was plenty of room for my wife and I as well as our sons and daughters who visited from Savannah for an evening get together. Many thanks to you Denise and Mermaid for a great action. We will definitely be back this fall. The grill is missing parts so it really can't grill; lava rock, pan to distribute the heat. The FL room sofa needs replacing as does the little Adirondack chair in the living room as well as the plastic outdoor table. I suggest a wood shower floor grate over the slick slanted shower floor in the spare shower. The owners were very sweet and kind and told us the history of Canty's Cottage. We loved it and had a wonderful time. Thank you so much. Happy to see you back for another stay with the Mermaids! We will certainly pass your feedback along to our owners and appreciate you partnering with us to make Canty's the best it can be. We look forward to having you back for more Tybee time and Mermaid Denise is always standing by to help you make that happen.....your Mermaid family! Very nice.. Weather didn't cooperate but we all had a good time still..
Yep, Mermaids do fall short sometimes when it comes to the weather but we sure do try!! Glad you were able to enjoy the cottage alittle more though. Come give Tybee some more time soon, your Mermaid family! Love staying at Canty's Cottage! Close to downtown and AJ's...out of the fray and very comfortable. The company that manages Canty's Cottage, Mermaid Cottages, doe a wonderful job. We've stayed at 2 of their cottages and have found them to be extremely responsive to any requests we've had. We'll always stay in their cottages. Our stay at Canty's Cottage was perfect. The house was clean, well maintained and just as described. It had everything we needed. We loved the location, the yard and the layout of the home. The ladies at Mermaid Cottages were terrific. We would definitely stay here again and recommend the house and Mermaid Cottages to anyone. What a delightful stay at Canty's Cottage. As before, Mermaid Cottates always delivers and with the extra special touches! The cottage was charming and well equipped. GREAT location! We had a wonderful stay. Great location, clean cottage, and very comfortable. This Hurricane had a Silver Lining! We were originally suppose to be renting another home, but it was damaged due to the recent hurricane, however, this company made it right by placing us in this FANTASTIC home! While the parents are unpacking, the little ones will have many areas to explore, and Mermaid Cottage HQ is just right across the street towards they inlet! Walk over to Alley Way to watch the sunset, and if you're lucky, you might get to meet a mermaid or two! I got to meet Sailor! What a sweetie! I loved the fact that I could see the water from my bedroom window! It's also just a short walk to AJ's Dockside for an amazing hamburger and stunning sunsets! We were comfortable and relaxed in Canty's Cottage. The house is sturdy and very well maintained. It is decorated by with charming, comfortable furniture and lighthearted paintings. The kitchen has everything and the grounds are well tended and inviting. It was very good. Nice cottage. Clean. The Mermaids are a Class Act. On arrival, Canty's Cottage was a little warmer than our little bulldog liked, we called and talked with Mermaid Linda and she was kind enough to send Steve over with a brand new fan and we had no other issues. Our time on Tybee was wonderful, our daughter flew in from San Diego and joined us for the week. It was just such a nice week to have good, quality family time. We kayaked to Little Tybee, saw dolphins and just enjoyed a relaxing week away from our ever day life. Thank you Mermaid Cottages for giving us this week to relax in such a quirky cottage, close to everything. Love the house, been here before and will come again. Great location, close to most. Very quite and safe. Great for pets. On the downside the exterior could use a little TLC but should not stop you from enjoying this great house. I loved the location of the property. 5 minute or less golf cart ride to the south end of the beach. I felt the patio are of the property could have been a little cleaner. Interior was clean a little dated in the furnishings, but not a deal breaker. Gas grill provided. I would stay here again. We came to Tybee for field trips on the island. We've never been to the island and was pleasantly surprised. This was also our first experience to use the vrbo site. Upon arrival we noticed the lawn was well manicured and the delightfully decorated. This place has a wrap around yard with a wall for privacy. Great for dogs. Inside the home it was so nice to 2 separate living areas and an updated kitchen. Our bedrooms were comfortable and clean. The best of the home was having a large laundry room right off the Florida room. We were able to keep beach towels and suits clean and ready for the next day! We really had no needs because it was all there at our fingertips. We enjoyed a much needed rest at Canty's Cottage in mid May. The house although not plush or modern, was cozy and welcoming. The beds were comfortable with wonderful soft, sheets. All appliances worked properly and chairs were comfortable. We loved being within walking distance of the Back River Beach, which saved lots of quarters and prevented clock watching while walking. This is our favorite beach because of the abundant wildlife and because it is often almost empty of other walkers/sunbathers. Seeing a mother dolphin feeding with her new calf was a highlight of our trip, but our walks yielded other treasures like live sand dollars, starfish that crawled on our arms, and burrowing olive shells. Although we had plenty of rain during our stay, we found plenty to do and managed a day trip to Savannah under cloudy skies. As usual, the mermaids made us feel very welcome, and although my cell phone did not accept calls in the cottage, they left messages to let us know they were available if we needed them. My only criticism would be that the outdoor furniture was a little uncomfortable for our old bones. Loved the shower behind the laundry room! Many thanks to the owners and the mermaids for another wonderful respite in Tybee. Our stay at this cottage was very enjoyable. All of our needs were met as usual. The Mermaids are excellent! Flawless, great customer service, great location. The furnishings were old, but the total experience was very pleasant. The location was good and the house was clean. The enclosed patio was delightful. We came down on a Monday to attend a wedding on the South Beach Saturday. When we arrived the cottage was prepped and ready. The cleaning crew was just finishing and gave us a rundown of the amenities and some tips for the island. The property was cozy and the AC a welcome relief from the high heat and humidity that hit the East coast that week. The location was ideal and was a short 5-10 min walk to the beach, shops and restaurants. The BR were perfect for my 3 girls. The 20yr had her own room, and the 14 & 10yr shared the double, and the master was great for my wife & I. There is an extra shower in the back room, which came in handy. The street was quiet and the neighborhood friendly, but still close enough to evening action if you wanted. We are looking forward to returning sometime. BTW Savanna is about a 30min ride by car or Taxi. SAV airport expect 45min- 1hr depending on traffic. Canty's Cottage was a great place to stay - you can see a little water and it's a short walk from a quiet stretch of beach, as well as AJs restaurant and bar. Enjoyed the view from the porch. Beds were comfy. Just a note to those not from the area - take bottled water. Canty's Cottage is a wonderful look into the past. The vintage cottage is a step back into the fifties but with modern amenities. We loved our week there. We stayed at Canty's because there were few steps into the cottage. My daughter is in a wheelchair. Although the cottage is not fully wheelchair accessible, we managed. This would not be a cottage for those who have no help getting into the bathroom as the door is not wide enough for a wheelchair. With a few adjustments such as widening the bathroom door and a small ramp into the cottage this would be a perfect cottage for the wheelchair user. Absolutely wonderful experience for our family. The house was clean and well kept. Beds were sooo comfy. I would stay here again in a heartbeat. So much better than a hotel room...this made things feel like home. Thank you all for everything. This was a great place to come with family. We really enjoyed our time here. The house was spacious, and had everything we needed. What a perfect cottage to stay for a peach of a beach experience..love the artistic décor and fully stocked kitchen! It was immaculate and beds were very comfy..The outdoor terrace was perfect for dining and relaxing in the sun.The fenced yard was great for my dogs! We loved it all!! Rock House delivered yummy pizza and fresh boiled shrimp..went to Huc a Poos one night..delicious!.. and AJ's crab stew is a winner!! The cottage and outdoor areas were nicely appointed. The decor was beach themed and very nice. Life is about creating wonderful memories for those you love and for yourself. Canty's Cottage enabled the family to make those memories this past week while we enjoyed the weather, the ocean, the cottage, etc. The cottage was very clean. I loved the patio and the area. This is my third Mermaid Cottage to rent and I plan to return. Thank you once again Mermaids (and owner) for the retreat.!!!!! Canty's cottage was perfect for our 7 night stay during Christmas/New Years . There were 4 adults a toddler and an infant.the location was perfect for walks along the back river beach area,the fishing pier and public landing for kayaking or boating .Within easy walking distance of AJ's seafood restaurant and the famous Breakfast Club.the cottage was very clean,comfortable and well maintained.the owner stopped by to make sure everything was to our liking.Mermaid Cottage customer service was first rate! Would definitely rent this cottage again and have recommended it to several friends! This place was perfect in all ways...We had a ball. Excellent overall. The owner is particularly gracious. Wish it could have been closer to the ocean though. The restaurants on Tybee were great and our day trip to Savannah was wonderful. We had a great time, and the house was terrific. Love the outdoor area for grilling and chatting. Great location! Comfortable and Relaxing. Would come back again. We first rented a Mermaid cottage for my morhers. 90th birthday. She is now 95 and we have come to Tybee every Christmas since then and rented through Mermaid Cottages . Each place we have stayed at was good but Canty is perfect. A fenced backyard for children or puppies. A good furnace and kitchen stove. The location is great and it is perfect for a week long stay at Christmas. Giving thanks to everyone who made our Canty's stay perfect! Canty's was well equipped to cook for family at Thanksgiving. The flat screen in the FL room was perfect for football. The house was immaculate inside and out. The Mermaid's who managed the booking swam us through the process in the most graceful and kind way. We gave thanks to our many blessings during Thanksgiving and to our wonderful experience in Tybee. My wife, daughter and I stayed for 3 nights. We were in town for the Savannah Marathon. The Mermaids were so helpful through the process. The house was beyond words. We wanted to move in. The owner called the day we checked in to ask if we needed anything, see brought us 2 blankets within 5 minutes. We would go back in a heart beat, and hopefully soon. We will be using Mermaid Cottages everytime we go. Great rental company to work with! We had a wonderful time at Canty's Cottage and the mermaid were all amazing again. One of us accidently locked the door with the keys inside, and within five minutes of calling, Brandy came and let us back in. This is the second (actually the third) cottage I have rented and all are exceptional with everything you need. A great unwind location! Had a wonderful stay. The cottage was wonderful. The location was great, convenient to everything! Loved it! From the minute we opened the door we felt very comfortable. This home is in a quiet area but close to everything, AJ has the very best crabmeat soup you will ever eat. We will go back and we will stay with the kind and friendly folks at Mermaid Cottages they followed up on everything and the cottage has everything you need to cook with, and we mean everything plenty of kitchen items to prepare your meals should you wish too. Thanks Mermaids we will be back soon!!! Perfect cottage, spacious and clean. It is equipped with absolutely everything you can think of. My family enjoyed it, we would definitely come back. We LOVED the cottage, and our vacation in Tybee! Other than the cottage being a short jaunt from the beach ( you will need to rent bikes or plan to drive to the beach for the day if you don't want a 10 minute walk), it was in a lovely, QUIET location with a view of the river. We found a bike, kayak, beach chair, and boogie board in the storage shed, and played with them all week. The house was extremely comfy, and clean. The 2 living areas were perfect for having a TV area for our son, and a more quiet, cozy area for my hubby to sit back and play his guitar, and sit and gather with friends. Zero complaints!! Last month we took our 2 adult children, son-in-law & 3yr old grandson to Tybee for a vacation. The cottage was perfect with the fenced in backyard and the 2 living rooms. Conversations in one & TV in the other. We have family on Tybee and dinner one night was 13 people, another night was 9 people and although the kitchen is small it is well appointed and everything went well. With the outside seating, there was plenty of room for everyone. The best part was the close proximity to the little beach - close enough for a 3yr old to walk to (several times a day). The shower & dressing area at the back door was more useful than anticipated. No sand tracking into the house. The laundry facilities were a pleasant surprise and used alot. We did look at some other rentals while we were there in making our decision for next year because I'd really like a second toilet with so many of us, but it really wasn't as much as an issue as I thought it would be and we didn't see anything in our budget that we liked better. So, next year it will be Canty's Cottage for us. The best vacation we've had in years. It definitely was a blessing to have a House Rental over a Hotel. With our two year old daughter we needed the bigger place for her nap times. It was also nice to have Washer and dryers in the Unit available to keep laundry clean. Great property. Convenient to kayak launch. In this hub-bub world, it's nice to throw back, rest and rejuvenate. Canty's Cottage was the perfect backdrop for comfort and quiet; from the laid back decor to the tiki hut out back, this cottage was a dream. We love Mermaid Cottages and very much appreciate each and every mermaid! As always, thank you. See you in July @ Basking Under the Tybee Sun! We were very pleased with our stay at Canty's Cottage. It was well equipped for cooking at home. A very clean property with nice open space for visiting. The staff at Mermaid Cottages is absolutely fantastic. We stayed at Canty's cottage it was spacious, had a great fenced in yard for our dogs and was within walking distance to beach, shops, restraunts and more. We have already made reservations for next year. We loved our stay at Canty's Cottage. We would definitely stay again. The beds were so comfortable and the furnishings very nice. This was our second stay with Mermaid Cottages this year and we could not be happier with the service and the cottages. The only disappointing thing was there was not an outlet outside that we could find and we had wanted to rent an electric car for a few days, but had no way to charge it. The sunsets on this end of the island definitely made up for it. Stay with the Mermaids, you won't be disappointed! We will be back. For a second time, we were blown away by a beautiful and affordable cottage. This one had less traffic, less noise, but larger, and only about 2 more blocks from the beach. Canty's obviously is cared for by someone with a real love and pride for this cottage. Everything was perfect for my family of four. Anyone coming to Tybee should call Mermaid Cottages and Mermaid Cottages ONLY. They are THE absolute best company to work with. They're so understanding, helpful, and patient. Wonderful! And Canty's Cottage - our favorite for sure. It is a beautiful and quiet property that is close enough to all the happenings, including restaurants, beaches, piers, marsh views, you name it. This was our second stay at Canty's. Each stay we love it more and more. Wish we could go there every month! Had a wonderful time, very nice cottage, would like there to be a TV in one of the adult rooms and we did see a few roaches/palmettos during the stay - other than that - was great!! My wife and toddler aged daughter had a wonderful time at your property. We are already trying to plan for our next trip down! Everything was so clean and comfortable. Thanks for having us! Words cannot describe how much I loved my stay at Canty's Cottage. It was everything a cottage at the beach should be. It was very cozy, had spacious accommodations, very clean and had everything you'd need at a "home-away-from-home". I hope to visit every year! The house was very clean and well taken care of. There were lots of extras in the kitchen that are normally not included in a rental. We waked down the street to AJ Dockside for some meals on the water and to rent a kayak to go to little tybee....great experience. We also could walk downtown and to the beach. Highly recommend the house and Mermaid Cottage Rentals. Lovin' me some Tybee time! This was our first trip to Tybee and we loved it. I wanted to give my girls a beach vacation that they would always remember and this was exactly what I was looking for. The location was perfect, the house was clean and cozy. We made good use of the bbq grill and the hammock in the backyard. The locals are friendly. We were able to get the beach experience and the quaint friendly small-town experience at the same time. My girls are already asking to go back next year. I do hope that we get an opportunity to visit Tybee again! If so, we will definately be calling on Mermaid Cottages again. The cottage was perfect for a relaxing vacation. It had everything we needed. Walking distance to the beach and activities. Thank you! I live in Savannah and we had guests from Indiana visit. A friend recommended Mermaid Cottages and I am SO glad she did. We are already planning our next vacation! I have not been to Tybee in 16yrs. We found this property online. Ihad originally reserved another mermaid cottage but the girls at the office new my concern over traffic and closeness to the beach and river. Cantys Cottage was fantastic! Across the street from the river and blocks away from the beach.Besides the cottage feeling like our home away from home we loved the quietness there. More laid back. We will beback and Canty's will be the cottage we pick again! We felt so good in our exceptionally clean and lovely home we rented from Mermaid Cottages. Cantys is awesome and always stocked with great spices and helpful items. Its like you're home. Cantys was the base house for two of my daughters, Sara and Haven weddings. Great back yard and large side yard for my boat and parking. My husband and our family were thrilled by Canty's Cottage. This is our second summer using Mermaid Cottages and were have been truly impressed with both of our stays. The cottage is located fairly close to the boardwalk and beach. 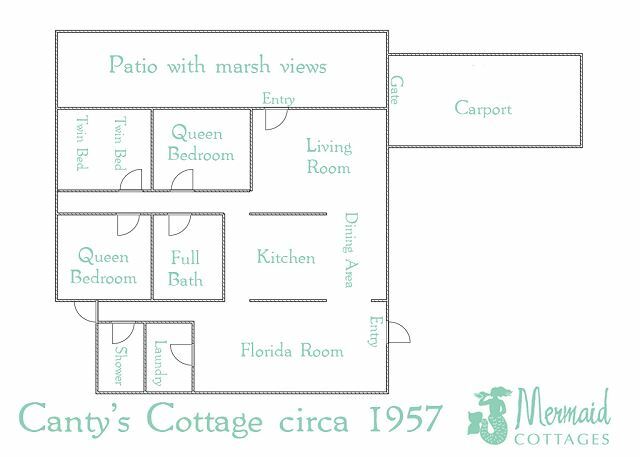 The cottage itself was spacious, clean, and inviting. The kitchen had fully stocked glassware and ample appliances. The outside patio and backyard also added a bonus. My husband and I enjoyed sitting on the patio and watching the wildlife (birds) in the mornings and evenings. Overall, our stay was extremely memorable and we would highly recommend Canty's Cottage to anyone! Thank you for an awesome experience! I was very impressed with the cottage-the attention to detail and the quality of the furnishings was wonderful! Very comfortable. The kitchen was well stocked with everything you need to cook except for a mixer. We'll be back!